for $1,295,000 with 4 bedrooms and 5 full baths. This 4,700 square foot home was built in 1975 on a lot size of 0.9183 Acre(s). 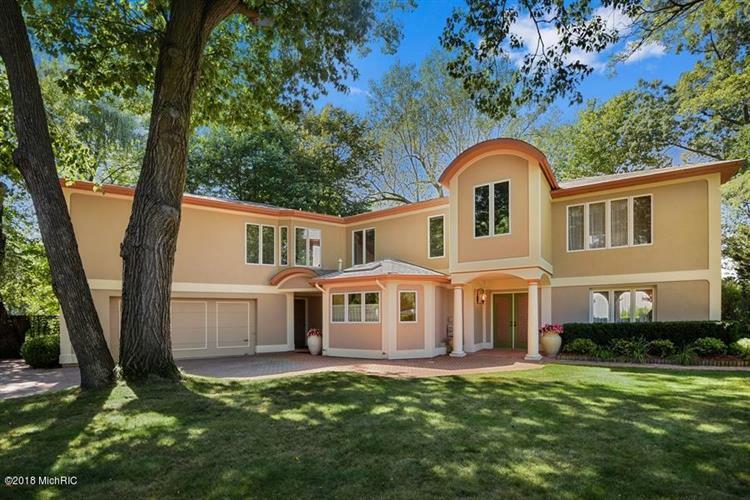 One of the FINEST LAKE MICHIGAN BEACH FRONTS on the market! Words cannot describe this one-of-a-kind custom designed 4, 700+/-sq. ft., 4 BR, 5 full bath, Lake Michigan waterfront home featuring views from almost every rm & includes an adorable beach house with a, bath, kitchenette & living area all on 100+/- ft of private Lake Mich beach frontage. No expense was spared when it comes to the attention of details; truly they're beyond phenomenal. There's a lakeside 2-story sunroom w/sky-high wall ofwindows, a hand carved curved staircase trimmed from Germany, heated tile floors, top-of-the-line kitchen w/custom maple cabinets, granite counters, 2 lakeside master suites, curved walls, imported Italian marble, tray ceilings, ornate details & sliders to veranda w/lovely views. This European inspired home rests on almost 1 acre & offers a courtyard w/charming brick pavers & built in barbecue. Just minutes to St. Joseph, Harbor Shores Golf & Marina.